My girls are at the age where they love to play mini-golf. Believe it or not, I never had this opportunity as a child so as they are learning to play, so am I. I hate to admit that I am not much better than they are, either! But we play for fun, not for score, so it is a good time for all. 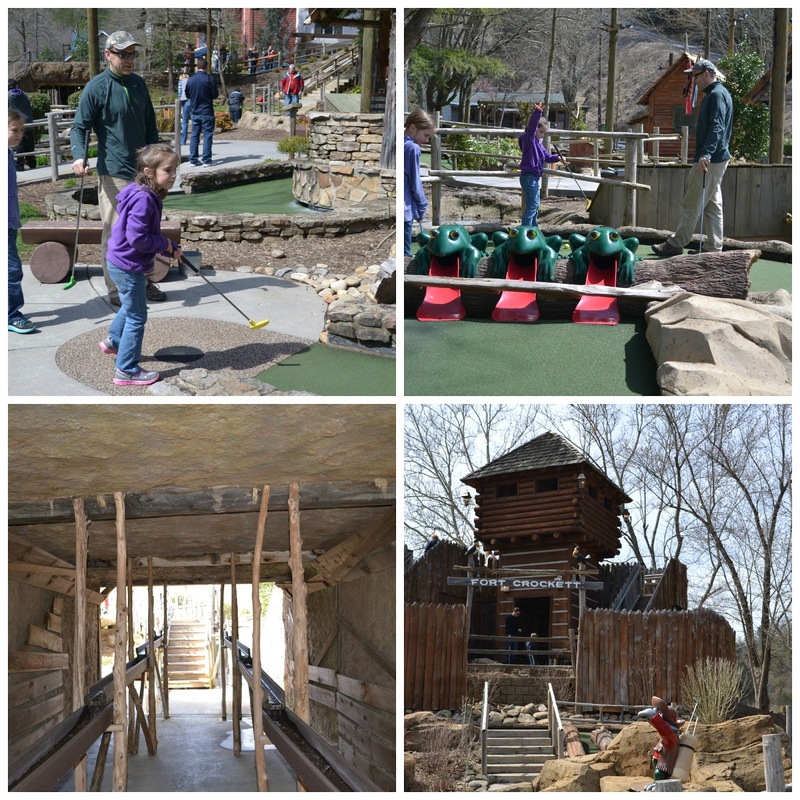 When we were in Gatlinburg, we stopped by Ripley's Davy Crockett Mini-Golf. If you are familiar with Gatlinburg, you know about the traffic and parking. Davy Crockett Mini-Golf is located at traffic light #1. 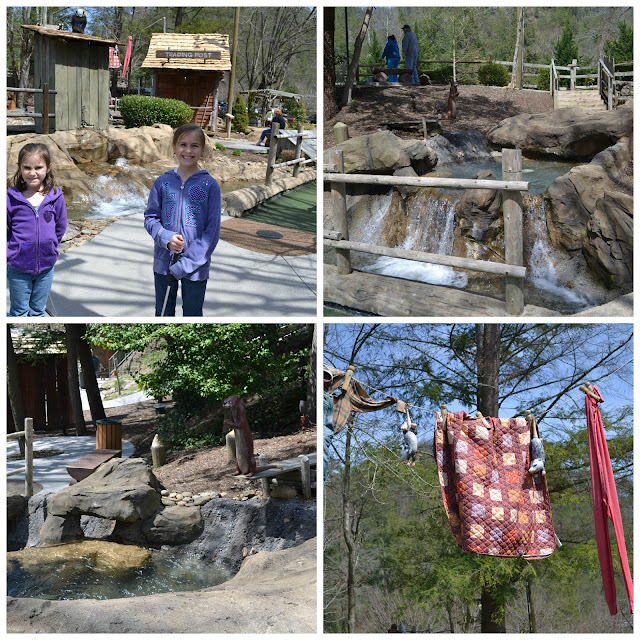 We were able circumvent the traffic on the Parkway via some back roads (just check any map--it is easy to find the back way) and as we approached, we saw a glorious sign--Davy Crockett Mini-Golf Parking! The parking was free, so this was even nicer! Davy Crockett is also located right on the trolley line. The setting of the two 18-hole courses is beautiful. With the Great Smoky Mountains as the backdrop, the courses replicate the "old days" of Tennessee hero Davy Crockett roamed the hills. Streams run through the courses, complete with small waterfalls. Sounds of birds chirping are piped in. Various animals, including ducks, possums, frogs and skunks adorn the course. Some animals talk or sing as you pass through. One course felt like you wandered upon someone's property was filled with hillbilly shacks, the trading post and laundry hanging from the clothesline. In the other course, you wander through Fort Crockett. The course is extremely well maintained, as are the restrooms. Snacks are available for purchase at the entrance. I really enjoyed this course. It was very peaceful and fun and away from the Gatlinburg crowds. Options were available to make the game more challenging, so my husband enjoyed taking those shots. And although the trees didn't have their leaves yet, it is obvious that this is a very shady course during warmer weather. The courses do have stairs, it has modifications for handicap accessibility or strollers, still playing 18-holes. If you manage to get your last shot in the squirrel hole or the rabbit hole (depending upon the course you play) you will win a free game. We really had a nice time and will definitely be back! Open Year Round Weather Permitting. Hours change seasonally, please call for hours. Tickets can be purchase at the gate or online. Discounts are given for combo tickets. Also, check local magazines for discount coupons. Disclosure: I received complimentary tickets in exchange for a review. As always, this review contains my honest opinions. This is a very nice review. I'm glad your family had fun. We want to take the kids to play mini golf soon. This looks like a great fun place - Love the character of the course! This looks absolutely fantastic, if I lived closer I would definitely be going. I love the whole theme, brilliant.